MANILA, Philippines - The journey of a rock band and a story about a daughter who finds his father will be some of the featured films in the 2011 Korean Film Festival in the Philippines that will run from Sept. 20 to Oct. 2 in SM Cinemas in Manila and Cebu. In a press conference held recently, Seong Un Hwang, director of the Korean Cultural Center of the Philippines, said this year’s festival theme will be about love. Last year, the Korean Film Festival screened horror movies. Under the theme “7 Different Colors of Love”, this year’s festival will feature seven films that headline some of Korea’s famous stars including singer-actor Jang Geun Suk, Cha Tae Hyun and Song Hye Kyo. Korean Ambassador to the Philippines Hye Min Lee will grace the premiere screening of “Secret Reunion” on Sept. 19 at Cinema 6 of the SM Mall of Asia. The seven films will be shown at Cinema 6 of SM Mall of Asia and Cinema 3 of SM North Edsa from Sept. 20 to 25. Fans in Cebu will be able to see the films at Cinema 1 of SM Cebu from Sept. 28 to Oct. 2. All the screenings are free to the public. 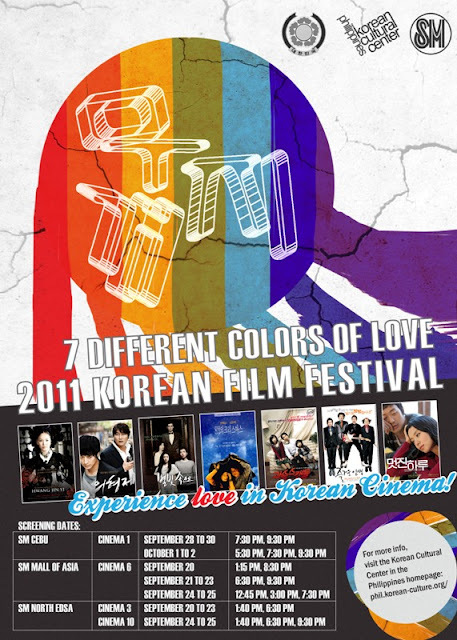 The 2011 Korean Film Festival is organized by the Korean Embassy in the Philippines, Korean Cultural Center in the Philippines and SM Cinemas. “SECRET REUNION” (Starring: Kang Dong Won, Song Kang Ho). Song Kang-ho, an ex-agent of the National Intelligence Service who is very careful about his actions, is paired with Kang Dong-won, a former spy from the North. Song’s character was released from the NIS six years after the gunfight which happened in the heart of Seoul; however, both men keep their identities hidden from each other. “SCANDAL MAKER” – (Starring: Cha Tae Hyun, Park Bo Young, Wang Suk Hyun) - Nam Hyun Soo was a very famous idol worshipped like God by teens. Though he is in his mid-thirties now, he is still one of the most sought-after celebrity in the industry and a DJ in a radio show. One of his listeners, Jung-nam, sends him letters narrating her willingness to see her father whom she never met. Her story became a hit and catapults the show’s ratings to be the most popular program. But one day, Jung-nam knocks on Hyun Soo’s door claiming that the father he hasn’t met is none other than him. “A HAPPY LIFE” – (Starring: Jang Geun Suk, Kim Yun Seok, Kim Sang Ho, Jung Jin Young) - The plot revolves around three former members of college rock band, Volcano, who were reunited by the death of their leader. At the funeral, a young, jobless lead guitarist Gi-Young (Jang Geun Suk) suggested that they reform the band with him as the new front man. “MY DEAR ENEMY” – (Starring: Jeon Do Yeon, Ha Jeong Woo) - Hee-Soo, who is living a miserable life as a single woman in her thirties, sets out to find her ex-boyfriend, Byoung Woon who owes her $1000. Byeong Woon is also penniless but knows that girls are willing to give him money. Hee-Soo follows him as he visits many girls for money and starts a one-day journey that will change her life again. “HWANG JIN YI” – (Starring: Song Hye Kyo, Yoo Ji Tae) - A film based on the story of Hwang Jin Yi, the most renowned courtesan of the Chosun Dynasty. She was a beautiful, talented and intelligent young woman who has no other choice but to become a gisaeng because she was an illegitimate child. The movie shows how she used her position and her charm to gain favor from the upper class, as well as his love affair with a male servant named Nom-yi. “FOR ETERNAL HEARTS” – (Starring: Jung Kyung Ho, Kim Min Sun, Cha Soo Yeon) -An ordinary college boy Su-young meets an extraordinary girl named Pippi on campus. He fell in love with Pippi which did not last long because the latter ended her life at a student demonstration. While trying to get over Pippi, he was hired as a tutor for a girl named Su-young. He was almost at the brink of giving up because of Su-young’s peculiar personality but something is stopping him from doing so. He soon fell in love with Su-young and bizarre things started to happen. “CHRISTMAS IN AUGUST” – (Starring: Han Suk Kyu, Shim Eun-Ha) -The film is about Jung-won who falls in love with Da-Rim while suffering from an unnamed illness. He hides the fact to Da-Rim and tries to continue living as usual, spending time with his friends and family. Sept. 19, PREMIERE NIGHT - SECRET REUNION - 7:30 p.m.
“Scandal Maker” - 8:30 p.m.
“My Dear Enemy” - 6:30 p.m.
“Hwang Jin Yi” -9:30 p.m.
“Christmas in August” - 6:30 p.m.
“Eternal Hearts” - 9:30 p.m.
“Secret Reunion” - 6:30 p.m.
“Happy Life” - 9:30 p.m.
“Hwang Jin Yi” - 12:45 p.m.
“Eternal Hearts” - 3:00 p.m.
“Christmas in August” - 7:30 p.m.
“Happy Life” - 12:45 p.m.
“Scandal Maker” - 3:00 p.m.
“My Dear Enemy” - 7:30 p.m.
“Hwang Jin Yi” - 1:40 p.m.
“Scandal Maker” - 1:40 p.m.
“Eternal Hearts” - 6:30 p.m.
“Happy Life” - 1:40 p.m.
“Christmas in August” - 1:40 p.m.
“Scandal Maker” - 6:30 p.m.
“Secret Reunion” - 1:40 p.m.
“Happy Life” - 6:30 p.m.
“My Dear Enemy” - 9:30 p.m.
“Christmas in August” - 9:30 p.m.
“Scandal Maker” - 1:30 p.m.
“Eternal Hearts” - 7:30 p.m.
“Hwang Jin Yi” - 5:30 p.m.
“Secret Reunion” - 9:30 p.m.
“My Dear Enemy” -7:30 p.m.
“Scandal Maker” - 9:30 p.m.
“Happy Life” - 5:30 p.m.
“Secret Reunion” - 7:30 p.m.
“Christmas in August” - 5:30 p.m.
“Hwang Jin Yi” - 7:30 p.m.